A recent health report published in the British Medical Journal claimed that even light to moderate alcohol intake escalates cancer risk in smokers. The standard for light to moderate is one drink (15g) of alcohol per day for women and two drinks (30g) per day for men. While the role of drinking, whether light or heavy but independent of smoking, in the causes of cancer is very hazy, this study conducted by Brigham and Women’s Hospital and Harvard T H Chan School of Public Health confirmed that the combined effects of drinking and smoking enhanced the risks of cancer. The study tracked the health and drinking and smoking habits of 47,881 men and 88,084 women for 30 years and in the follow up study found that 7,571 cancers and 19,269 cancers were diagnosed in men and women respectively. The research team found that light to moderate alcohol has a small and insignificant increase on the risk of cancer even for non-smokers. The study also found that the risk of increase from intake of light to moderate alcohol was seen in men who either still smoked or those who had at some time in the past smoked, but the risk for non-smokers among men did not increase. However, for women, increase in the risk of cancer, particularly breast cancer, because of intake of light to moderate alcohol increased even for non-smokers. Experts now say that while there seems to be no safe and guaranteed level of drinking; staying within recommended limits definitely reduces the health risks. 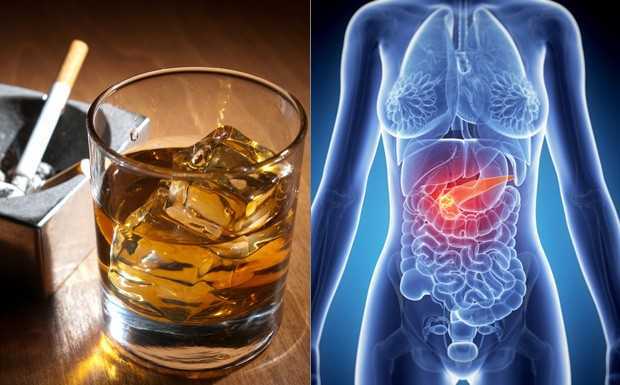 The risks from alcohol include higher probability of getting throat, mouth, liver, bowel and breast cancer; combination of smoking and drinking increases this risk even further; all alcohol types can cause cancer; the more the alcohol intake, bigger the risk of cancer; reducing alcohol intake could reduce the risk of cancer. Jurgen Rehm from the Centre for Addiction and Mental Health opined that given the results of this large study which proved the link between smoking- and alcohol-related cancers, it would be prudent for people with a family history of cancer to either reduce alcohol consumption or perhaps altogether abstain from it.